James A. Zegers, 70, of David City, died Saturday, August 6, 2016, at the Lincoln Rehabilitation Center in Lincoln. James Allen Zegers was born January 9, 1946, in David City, Nebraska to Lawrence and Thelma(Kindler) Zegers. 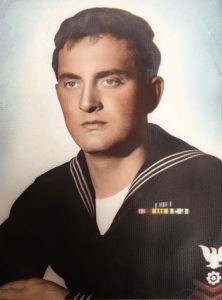 After graduating from High School in David City, he entered the United States Navy, serving from 1964-1968. He then married Vanessa Kaspar. James was a truck driver and worked for M & S Transfer for several years. He was a member of VFW Post 5814, served on the Honor Guard and recently received his 50 year pin for service during the Viet Nam Conflict. James is survived by his wife, Vanessa of David City, one daughter, Jamie(Chris) Kabourek, Lincoln, grandsons Aidan, Samuel and Charlie, siblings Richard(Ethel) Zegers, Kearney, Missouri, Dave Zegers of David City, Peter(Sheila) Zegers of Raytown, Missouri, Elizabeth(Charley) Price, Neokoma, Kansas and Robert(Mary) Zegers of Lawson, Missouri. He was preceded in death by his parents and siblings Rosalie Buck, John Zegers, Phyllis Erbe and Lawrie Egger.